Based upon our other low profile chest rig designs we wanted to bring to market the most streamline 762 chest rig that was scalable for weapons that use the 7.62 NATO or .308 bullet and would support 20 round 308 PMAGS/M14/MIA style mags. 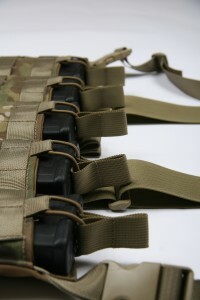 The 762 chest rig has dedicated magazine pockets which provide secure yet rapid and silent access to the mags. With three rows of molle across the entire rig there is a high degree of flexibility and modularity fo r the operator to tailor for mission specific needs. The chest rig is an ideal and discreet alternative to a full size chest rig or tactical vest giving you tremendous versatility. This rig can be worn over body armor or covertly under a jacket. Just like our other rigs the mag retention is attained with bungee shock cord and over sized pull-tabs. A full internal pocket allows for the storage of additional items. 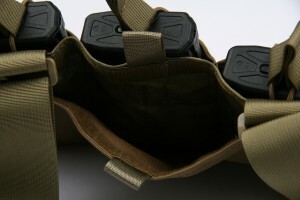 The 2” flat webbing shoulder strap H-harness provides plenty of support and does not interfere with the shouldering of the weapon. 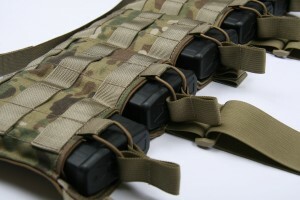 The harness provides for plenty of adjustment for use with body armor, outer garments and accommodates most body sizes. The 762 chest rig is available in a 4 mag or 5 mag version. Multiple color options are available: Multicam, A-TACS AU/FG, Kryptek Highlander, Kryptek Mandrake,Coyote, Ranger Green, Khaki, Woodland and Black.